The new Disney adventure Moana finds the title character, the 16-year-old newly installed chief of Polynesian island, setting sail across the ocean to save her dying land and local waters. She is chosen by the ocean to locate a gem known as Heart of Te Fiti and return it to its place of origin. To do so, she must enlist the services of Maui, the demigod responsible for stealing the Heart of Te Fiti. Dwayne Johnson voices Maui and newcomer Auli'i Cravalho voices Moana in this latest offering from The Little Mermaid and Aladdin directors Ron Clements and John Musker. The task of bringing Moana to life fell to animation supervisor Malcon Pierce, who previously worked as an animator on Wreck-It-Ralph and Big Hero 6 as well as a supervising animator on Frozen. Pierce oversaw the animation of Moana from design onward. Pierce will next work as an animator on the upcoming Wreck-It-Ralph sequel. 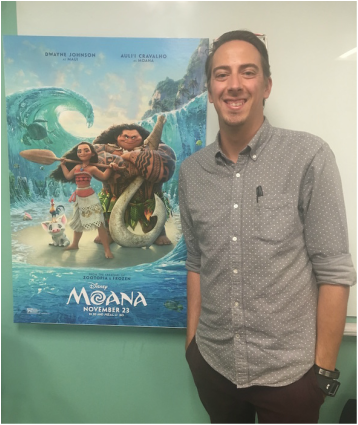 Moana animation supervisor Malcon Pierce visited in October to conduct a presentation of the film to students at the Art Institute of Austin and the University of Texas.